The US dollar managed to recover from its losses late yesterday pushing EURUSD lower. However, with the ECB meeting looming today, we could expect some volatility. Gold prices continue to consolidate near the 1250 levels, and the bias remains flat for the moment, with the upside likely to see 1260 – 1265 while to the downside support at 1230 – 1225 remains in focus. EURUSD (1.12): EURUSD closed on a bearish note yesterday following the previous three sessions of gains. 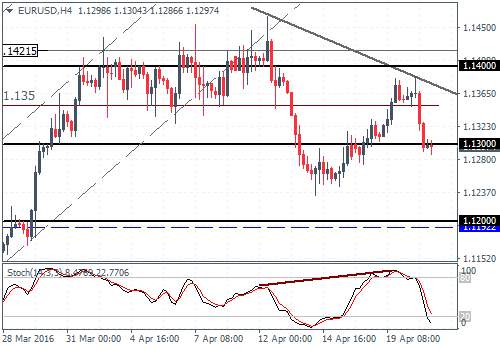 However, prices remain close to the 1.130 handle casting doubts on the downside potential in EURUSD. A daily close below last Thursday, April 14th lower close of 1.1267 is needed to ascertain further downside in the euro. Price action has cleared the 1.135 handle following the hidden divergence, and any retracements should see EURUSD confined to 1.135 level. A close above this price level could keep the euro range bound with the potential to move back to 1.140. To the downside watch for 1.120 level of support which could initially offer a short term bounce. USDJPY (109.8): USDJPY has managed to close bullish for the third consecutive day and is likely to see a push to 110.67 in the near term. The price dipped briefly to 108.95 to test for support before pushing higher and is now trading near the previous highs at 109.80 – 109.64. 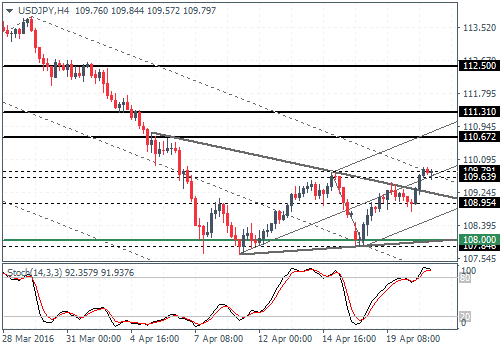 A close above this minor support/resistance is essential for USDJPY to test 110.67 – 111.31. Only a close above this price zone will confirm further upside. To the downside, a move back below the 108.95 could see USDJPY move sideways above 108 lower support. GBPUSD (1.43): GBPUSD has formed an inside bar after a brief test to 1.442 resistance the day before. The strong consolidation is seen below 1.4425 – 1.405 is likely to prevail for the time being, but there is a scope for a larger rally if GBPUSD manages to break above 1.4425. 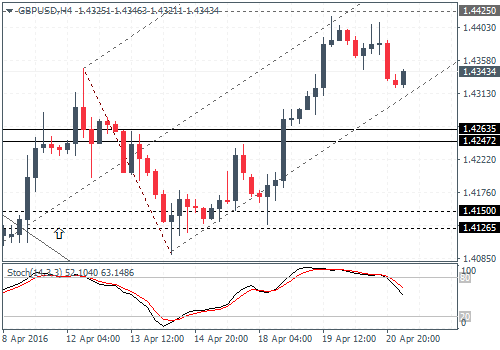 On the 4-hour chart, prices failed to pullback and tested the lower median line, which could indicate further upside in store, but resistance at 1.4437 – 1.4425 could hold the rallies for the moment, which could see GBPUSD potentially test the lower support near 1.4263 – 1.424. 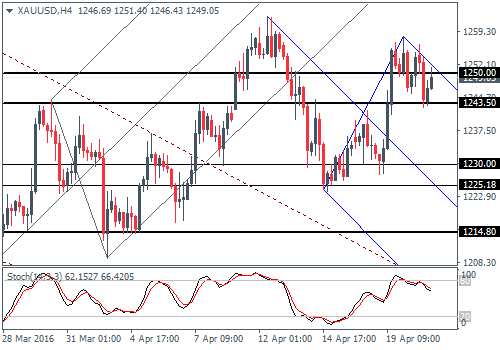 XAUUSD (1249): Gold prices are currently consolidating follow Tuesday’s strong rally as support is established near 1231.5. On the 4-hour chart, price action is currently within the falling median line which shows a downside bias validated by the lower high made recently. 1250 remains a key level, but a breakout higher could see a gold rally to test the previous highs near 1262. To the downside, 1230 – 1225 remains a key support level in the near term followed by 1214.